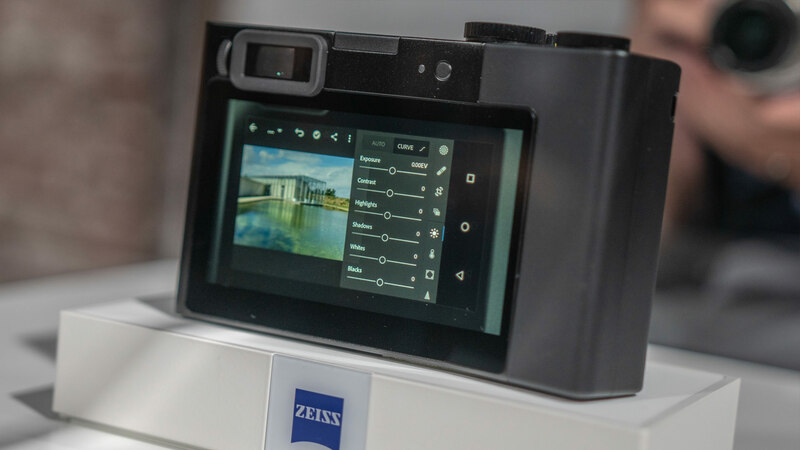 ZEISS just announced the ZEISS ZX1, their new full frame camera, featuring a sensor developed in house, a 35mm F2.0 fixed lens, 4k 30p recording onto an internal 512GB SSD and photo editing on camera via built-in Lightroom Mobile. Keep reading to find out more about this daring new product by ZEISS. ZEISS is well known among photographers as well as cinematographers for producing premium glass, boasting incredible sharpness, little distortion and as some claim a certain undefinable “pop”. However aside from some collaborations on smartphone lenses with a certain company known as Nokia back in the day, they haven’t really been making digital cameras. And even in the film world their last camera was the ZEISS Ikon, an M-Mount rangefinder camera introduced in 2004. Cut to 2018, they just introduced a camera which follows its own daring concept. The ZEISS ZX1 is a modern digital rangefinder with a full frame 37.4 MP sensor developed in house by ZEISS themselves. The fixed lens on it is a ZEISS Distagon 35mm F2.0, with ZEISS’ T* coating. It does have AF, but a manual aperture, that can also be set to auto on the lens itself, similar to how FUJIFILM handles this in their cameras. The same goes for the ISO and shutter speed dials on top of the camera. What jumps out at you about this camera is that ZEISS obviously tried to cut away everything unnecessary. The body, which weighs in at only around 800g including a battery, looks like a unibody-style shell, with only a sleek bulge for a grip. The shutter button, ISO dial and shutter speed dial are the only controls on top of the camera. 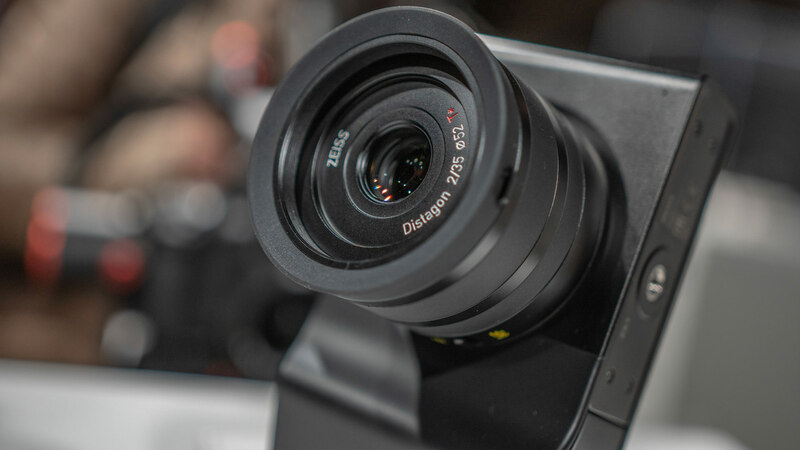 The back is just as minimalist, accommodating just the 4.3 inch 338 ppi LCD, the 0.7 inch OLED viewfinder (boasting 1080p resolution), one button and the diopter dial. That’s it. On the photographic side it seems to lean heavily on street photography, aiming to be an all-rounder wide angle camera. ISO goes from 80-51.200, shutter speeds go up to 1/8000s utilising a near-silent leaf shutter. The lens focuses up to a minimum focusing distance of 30cm / 1 ft. and ranges from F2.0 wide open to F22 completely stopped down. The ZEISS ZX1 shoots up to 3fps continuous, though there is no word on whether there is phase detect autofocusing. There’s a hot shoe that supports Sigma flash protocol. The technical specifications at this point aren’t very specific about the video features. The ZEISS ZX1 can record 4k UHD in up to 30p and 1080p up to 60p. There is a record time limit of 15 minutes per clip. Whether the codec is H.264, H.265 or something else entirely isn’t specified yet. That’s where we’re leaving the common territory. The ZEISS ZX1 doesn’t use SD cards, or any other cards for that matter, but relies on a whopping 512GB of internal flash storage. According to ZEISS this is enough for up to 6800 full-res RAW images, 50000 JPGs or 20 hours of video. Shot footage can then be offloaded to external storage via USB-C, using the USB 3.1 protocol, or backed up via the built-in Wifi. NFC and Bluetooth are also onboard, to facilitate easier connection to other devices, for example for geo-tagging or remote control. The ZX1 has a built-in microphone and speaker and seems to be able to adapt its USB-C connection to either an HDMI, headphone or microphone jack. The camera seems to have its own rather full featured operating system, being able to connect to cloud services like Dropbox or even send out emails. Although ZEISS’s marketing materials seem to be focusing on street photography, this kind of camera could appeal to a wide range of shooters. If nothing else it serves as a reminder of what is possible today, both in camera software, as well as design truly focused on shooting without any distractions. Maybe some other manufacturers will take the hint and stop giving us tabbed menus some time soon. It is 2018 after all. What do you think? Is this a camera that stirs some interest in you? Would you use it for video shooting?